Adobe® Reader®, free software for viewing and printing Adobe Portable Document Format (PDF) files, is required to access e-books presented on this CD (Reader 5 or higher). To download or to upgrade your Adobe Acrobat Reader go to www.acrobat.com and follow instructions. 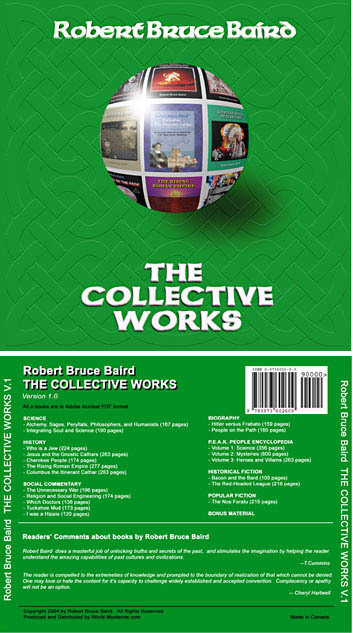 20 e-books by Robert Baird on a CD at a great discount price! Value of all e-books on this CD is: $137(US) (if purchased separately). Please click on the cover or the PDF link under an e-book you would like to open. The Tree of Life or Yggdrasil shown here is an amalgam of many systems throughout the world. This seeks to make a few of the ancient languages derived from Ogham and passed on to modern civilization by the Phoenicians. There is a lot in every symbol and some are archetypes with power to tap in to knowledge if approached properly. The Hadji Ahmed Map shown here includes the Ptolemy Map of the Mediterranean but that was just to keep secret the far better knowledge the trading groups actually had. Corporate ventures were big and this map shows what took until 1958 with modern technology for us to learn. The Pyramid of the Sun and the Great Pyramid of Egypt are almost or very nearly equal to one another in base perimeter. The Pyramid of the Sun is "almost" half the height of the Great Pyramid. The ratio of their height to the perimeter of their base are both based on the mathematical ratio 'pi'. The perimeter of the base of the Pyramid of the Sun is 4pi times its height, whereas the Great pyramid of Giza's base perimeter is 2pi times its height. The mathematical ratio 'pi' is based on knowledge of geometry, so the use of 'pi' implies knowledge of sophisticated mathematics also. Historically, the Aztec name for the huge basaltic monolith is Cuauhxicalli Eagle Bowl, but it is universally known as the Aztec Calendar or Sun Stone. It was during the reign of the 6th Aztec monarch in 1479 that this stone was carved and dedicated to the principal Aztec deity: the sun. The stone has both mythological and astronomical significance. It weighs almost 25 tons, has a diameter of just under 12 feet, and a thickness of 3 feet.